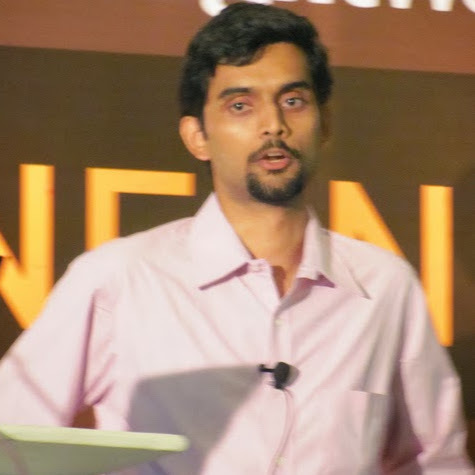 Karthik is a maverick who continuously hones his craftsmanship in software development and management. He has donned many hats/roles in development, testing, business ￼analysis, and project/product management in both the greenfield/brownfield development and support/maintenance projects. Continuous observation, experimentation, practice and (un)learning is his daily karma. To his credit, he has helped top and middle tier management to appreciate and adopt Agile mindset, by way of talks, workshops and games. He has coached several development teams to embracing Agile practices and go beyond. In the past he has presented in numerous Agile and technology conferences, meet-ups and geek-weekends in Asia, Australia and Europe, including Ruby Conf, Agile Tour, Agile By Example, Next Generation Testing, Dev Day, Agile In Business, LAST Conference and XP Conference. And he has also facilitated code-retreats and dev-camps apart from involving in other volunteer activities including being core team member for Agile India 2014 and committee member for Agile Kerala 2013. Not so often, Karthik shares his experiences and perspectives through his blog http://blog.codonomics.com/. He (re)tweets with handle @codonomics. He also manages to give back to the community by way of open-source contribution like [Twilio-Ruby](https://github.com/twilio/twilio-ruby/pull/129), answering at StackOverflow and the like. Agile has made a huge head way into the organisational buy­in for adopting it. More often than not, this buy­in has been the result of business competition and Agile being the hottest buzzword today. Now the reality bites hard, in the sense that more often than not a lot of things go wrong in many aspects of Agile adoption. This session is a talk with heavy interaction, questions, quizzes, and lot of learning in a brain friendly way. But fault­finding is the easiest thing. Can Karthik provide concrete solutions? Yo!, he intends to share the solutions as well for most if not all the problems. The purpose of the talk is for the audience to reflect on their every­ day Agile experience back in their offices, help them laugh out their mistakes, carry lessons from the talk in light­hearted, brain­ friendly way, and most importantly apply the lessons learnt back in their workplaces. #NoEstimates is fairly a controversial topic that is gaining momentum. This session is about debunking the myths of doing estimation, learn the top things that go wrong with making estimates. The title is the way it is to grab your attention. If it is not for the gaining popularity of #NoEstimates, I would have titled this session as "Estimation Anti-Patterns" and then guess what, you'd think you're doing it all right and that this session is not for you. While I don't love to hate the choice of #NoEstimates, I'm deeply concerned with the way estimates are done at Ground-Zero and the then blaming #DoEstimates as a process for it all... and consequentially adopting #NoEstimates. While I don't intend to address this attitude to finding excuse or blaming, I'll be sharing my experiences of many a things that go wrong with #DoEstimates and what we can do about it. By the end of this interactive session, we should have laughed enough at our own mistakes in the way we did or facilitated #DoEstimates and have the key take aways of doing it the right way when we get back to our professional work. * Is your love for Selenium (Se) fading, because it is not as cool as it seemed during your days of dating it? * I have too many browsers and its versions to test my app against. Se just doesn't fit the bill. * The Se tests are damn slow. * The Se tests breaks more and more as the test suite grows. * The Se tests are simply unmaintainable. As the test suite grows, I fail to understand what's happenning. * Debugging Se tests are hard. * My Se test suite bacomes a beast eventually consuming all the resources of the machine it runs on. When Agile becomes Fr-agile..learn your lessons the fun way!